It’s that time of year for hoops tournaments and kickin’ off National Nutrition Month®. The Academy of Nutrition and Dietetics annual March campaign focuses on bringing awareness to the significance of healthy eating and physical activity habits. 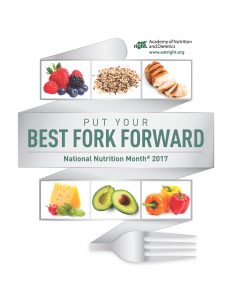 This month’s theme is “PUT YOUR BEST FORK FORWARD” which focuses on making small changes in one’s dietary choices- one bite at a time- to improve health. More veggies, please! Bite more veggies! Add chopped or grated vegetables (e.g., carrots, zucchini, and broccoli) to pizza, pasta, casseroles, or puree veggies and use as a sauce, or add to a favorite soup. Saucy fruits! Puree favorite fruits (e.g., berries) in a blender and pour over pancakes, waffles; add balsamic vinegar for a quick salad dressing. Dipping snacks! Baked tortilla chips in salsa, apple slices in low-fat yogurt, or graham crackers in unsweetened applesauce. Sweet tooth satisfied! Try a parfait with fresh fruit (berries, banana), low- fat frozen yogurt and sprinkle with a few nuts. For a hot treat, bake an apple and top with cinnamon and raisins. Want more ways to “PUT YOUR BEST FORK FORWARD?" Look for nutrition displays around the campus with ideas for eating a variety of healthful foods. Check out the DAHLC culinary classes for tips on cooking with healthier ingredients. The March cooking demos will feature Pot O’ Lentils. Also, get hands on practice for basic knife skills by attending the Wielding a Knife class. For additional nutrition resources to celebrate National Nutrition Month® with your family, community and others, download these free handouts and tips sheets from the Academy of Nutrition and Dietetics. Here’s to making each bite flavorful and nutritious!